CARNOUSTIE, Scotland — Xander Schauffele has enjoyed going under the radar as the least-heralded member of American golf's high-school class of 2011. Come Sunday evening, Schauffele might be leaving Carnoustie with the claret jug. He'll play on Sunday with Jordan Spieth, the most famous graduate from '11 and a guy looking to go back-to-back at the world's oldest major championship. "All the guys I've talked to said, 'Live it up while you can, fly under the radar,'" Schauffele said of his status. "Like, just today, I played in front of what you call Rory's crowd, I guess, and guys were just yelling all the time, even while he's trying to putt, and he had to step off a few times. "No one was yelling at me while I was putting. I kind of enjoy just hanging back and relaxing, sort of the San Diego, Southern California vibe, whatever you want to call it. It's cool with me." Thing is, Schauffele's results in his two seasons on the tour should command attention. He won twice last year in his rookie season on the U.S. PGA Tour, including the season-ending Tour Championship when he beat Justin Thomas — another from the gilded '11 class — for the title. Daniel Berger is the third well-known member of the '11 class — he had a strong college resume and went back-to-back at the PGA Tour's St. Jude Classic in '16 and '17 — but is No. 40 in the world rankings, 16 places lower than Schauffele. To the casual golf fan outside the United States, Schauffele might best be known as the player with the strange-looking name. "Typically, Europeans have an easier time handling it versus Americans," Schauffele said, and his background might suggest why. His father, Stefan, is half-French and half-German. He was an elite soccer player and decathlete, whose track-and-field career was cut short by a car accident on his way to training that cost him his sight in his left eye. Stefan moved to America, discovered golf, became a PGA Tour professional and taught his son how to play the game. Soccer is the Schauffele family's favourite sport — his great-grandfathers also played at a high level in Europe — so the World Cup was a big deal for Xander this month, especially since he is a quarter French. 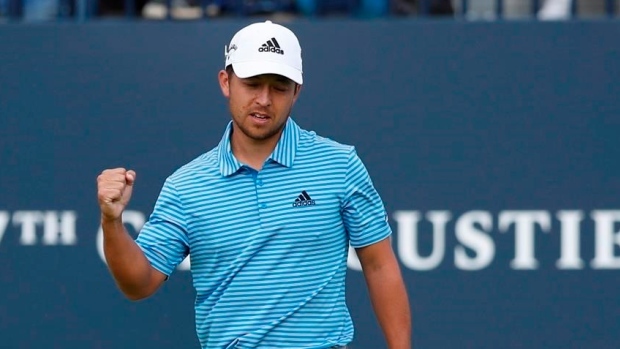 France won the cup on Sunday, by which time Schauffele was already in British Open-mode. After shooting rounds of 71 and 66, he birdied Nos. 5, 6 and 7 to make up for a bogey on the first hole on a warm Saturday afternoon at Carnoustie. He had successive birdies on the 14th and 15th before rolling in a long putt on No. 18 for a birdie that put him in the final group. "He didn't really put a foot wrong," said McIlroy, who faded for a 70. Schauffele now has to take out Spieth, even if it does mean finally putting himself in the limelight. "He's such a nice guy," Schauffele said. "If anything, we can hopefully get something going, and we can start feeding off each other. He won last year, and he's playing great golf right now. So I think he'd be a lot of fun."